As many of you know, I've been a member of USAFit since 2010 - I joined our local club when I was training for my first half marathon, and never wanted to leave. USAFit started 25 years ago in Houston and has expanded all over the United States - their general philosophy is to be safe and have fun while changing your life as you challenge yourself with running whatever distance you choose to train for. Of course I'm all about the fun when it comes to our running club, so no wonder this has been such a good fit for me. USAFit holds an Organizer's Conference once a year and since I'm an organizer, I got to go. I brought Amy with me as she's interested in taking on more of a leadership role with our club eventually, and am I ever glad she came! Not only did we have many adventures during the course of the three-day event, but it helped to have someone to walk into the room with...I'm a pretty shy person and it was intimidating at first, especially because so many people have been coming to this event for years and they all seemed to know each other. The first event was a social hour on Friday evening. We were nervous going into this, but the National Program Director, Debbie Mercer, greeted us with a hug and made us feel welcome. We got a drink and some appetizers and schmoozed our way around the room, eventually meeting up with the peeps from USAFit Montgomery, which is another small group on the outskirts of Houston. This was the group whose member, Amy, ran the USAFit Half Marathon in January, and who had the signs that said "GO AMY!". Our Amy told them how much she appreciated the signs, and I asked that they please include my name next year, lol. We hung out with them and a couple other ladies for a while longer, and then a lot of the group left to continue the party, while we went upstairs to our rooms - we'd had a very early start to our day and were pretty tired. The next morning, we went downstairs to the conference room, where we had a small continental breakfast and then the meetings began. It was nice to put faces to names, and get to know in person the people I've only dealt with online (for creating the schedule, or updating our website/Facebook page, and the graphic designer). We broke for lunch, and then in the afternoon they had a couple of seminars - one was on race walking and the other was on a pretty intense cross-training program; neither of which we will be doing with our group. They also had a shirt exchange - generally you end up with extra program shirts at the end of your training season, so the organizers brought their shirts to trade. I only had three unclaimed shirts, but many of the bigger groups had a bunch. Amy and I each got several shirts, plus I grabbed one for Jeff. It was fun to see all the different designs that other groups chose and possibly steal some ideas for our shirt this season. 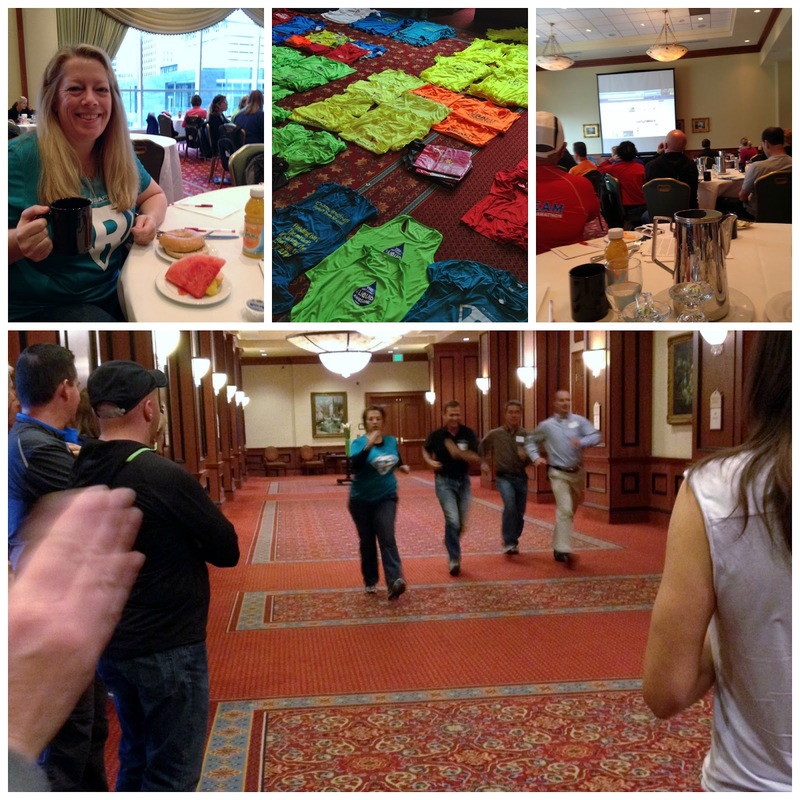 Clockwise from top left: Breakfast on day one; shirts laid out for the exchange; the view from the back of the room; Amy beating the men during the racewalk demo! We had a few hours off in the late afternoon on Saturday, and then we reconvened for dinner. It was fun to compare stories with other USAFitters, and toward the end of the meal we were asked to share any inspirational stories about our members from the previous season. My shyness took over and I couldn't bring myself to stand up and talk, but I would have talked about our youngest member, Love, if I had been brave enough to address the crowd. After dinner a bunch of people left to go out again - I swear, I don't know where they get that kind of energy! I was ready to relax in my room. Oh, we were sad. Scott talked this place UP as we were walking to it. Guess what WAS open in Downtown SLC on Sunday? Starbucks. Nice, dependable Starbucks. We sat for a while, with our coffee and scones, and quizzed Scott about how he runs his program - it's very different from ours and Michelle's as he has well over 600 members. I got some good ideas that I think will translate well to our smaller group, plus Scott was pretty funny to hang with. We went back to the conference before 9:00, but discovered that they had started the Q&A session already. They were talking sponsorships, which was the one thing I was really interested in, as I didn't do anything with that last season (shoot, we were lucky to get the program up and running with the short time-frame we ended up having). So that was a little frustrating, to know we'd missed about 45 minutes, but we were going by their schedule. I think this was the most informative part of the entire conference, actually...at least for us and where we are with our program. We had to cut out of the session a little early in order to get to the airport; maybe next year they can schedule this on Saturday so more attendees can participate - we weren't the only ones who had to leave early. Overall, this was a great experience and I'd probably go again next year, depending on the location (it changes each year). I came into it thinking that ours was one of the few smaller groups but discovered that there are more like us than I realized; I just wish we could have had a dedicated time for like-sized groups to exchange ideas. Maybe that will happen next year. You make me wish we had a USA Fit group around here. We really need something like this! I hope they gave you a survey about the conference where you get a chance to express your feelings about the sessions! I'm with Helen, I would love to have such a group as you have around here. Something so big as USA FIT we don't have here. Sounds like a very interesting but also fun trip. And great that Amy was there with you, it's always more fun to do these things together than alone. Yes, I agree--hope you will give them your ideas to improve the conference. They seem like simple, but very good ideas to implement. We are such a small group; it's hard enough to get coaches for our half and full groups...we are hoping to offer a 5K program during our next session, which would require yet another coach. Doing the racewalking would be a fourth group. Plus, I'm not sure there would be that much of an interest, honestly. What a great experience! I wish that French bakery had been open. Noooooo! on the bakery being closed (love how I focus on that??). Starbies is a poor substitute. I sounds like a fun time and that you got a lot of takeaways from it. Looks like you had a very fun time! I love Salt Lake City. The mountains and scenery are breathtaking. Love your goodies! That is so COOL. How much fun, I am jealous!